While many have simply taken a chunky sports watch and released a gold version of it to capture a segment of the market, let us focus on a few pieces where gold is an integral part of the aesthetic, and, in these cases, rose or red gold, for the perfect balance of warmth, magnificence and elegance. 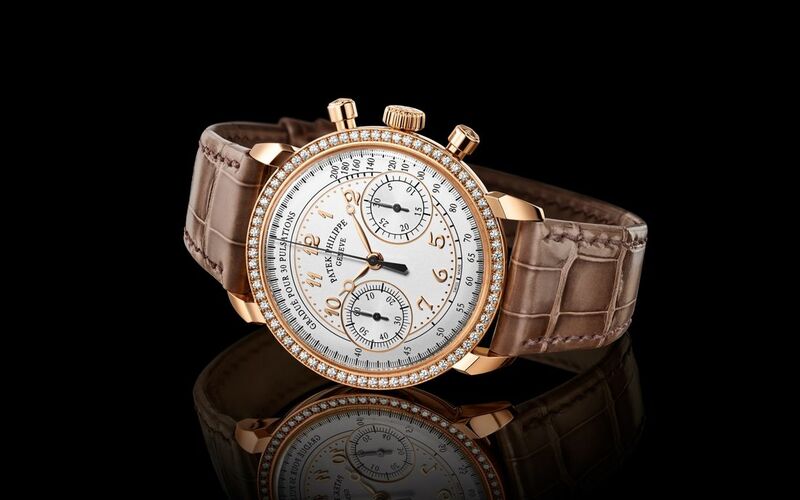 Designed for the highly discerning woman who appreciates a finely crafted piece of mechanical art, Patek Philippe has released a new manually wound ladies’ chronograph. In no way a simple downsizing of a larger model for feminine proportions, this new watch is elegant and a perfect fit for the modern woman. Crafted from 18k rose gold, the round 38mm case features a bezel set with 72 diamonds that surround a silver toned opaline dial with classic aesthetics, featuring sculpted Breguet hour and minute hands also presented in rose gold. The sleek design is emphasized by refined vintage-styled details such as the fluted and curved strap lugs, round chronograph pushers with manually guilloched faces and a gently cambered sapphire-crystal “box” glass. Way more than just a pretty face, the case houses the manually wound masterpiece of a movement. The Patek Philippe caliber CH 29-535 PS features an instantaneous 30-minute counter and combines its classic architecture with today’s precision and technology. The lavish decorations on the movement can be admired through the sapphire-crystal case back that is also slightly chamfered to meld perfectly with the profile of the rear bezel. 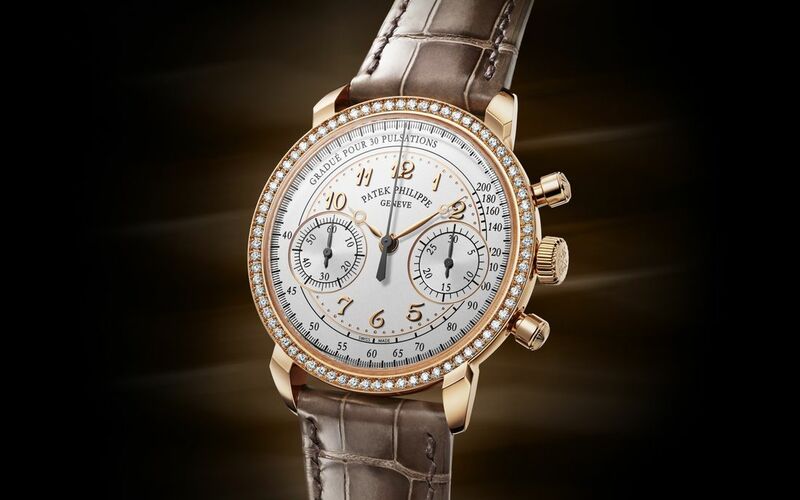 The only chronograph in the Patek Philippe watch collection for ladies, the Ref. 7150/250R-001 is worn on a shiny mink gray alligator leather strap paired with a rose-gold prong buckle that is also adorned with 27 brilliant diamonds. Released at SIHH 2018, the Montblanc Star Legacy Suspended Exo Tourbillon Limited Edition 58 is a showcase of Montblanc’s mastery of a classic and traditional artisanal aesthetic while pushing the boundaries of fine watchmaking. 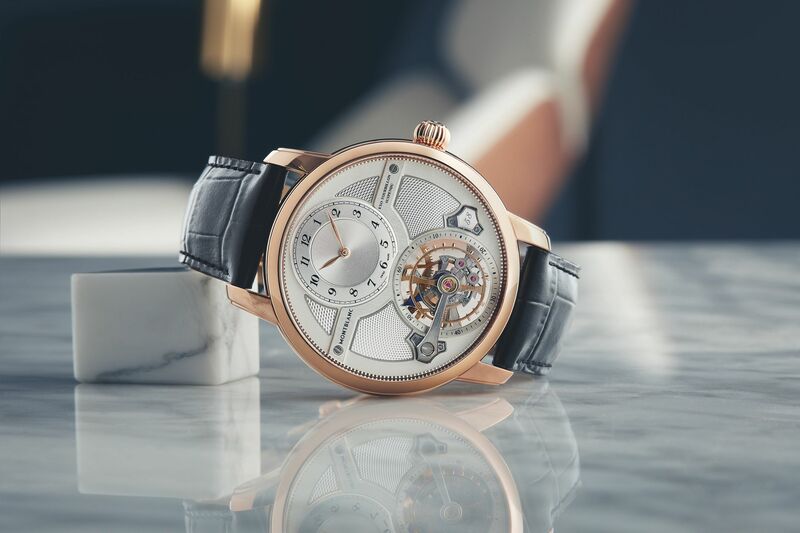 Developed entirely in-house by the master watchmakers at the Montblanc Manufacture in Villeret, the timepiece needed three years of design and development before it was ready to be shown to the world. The distinctive patented Suspended ExoTourbillon features an extra large balance wheel that is raised above the dial via a stainless steel arm and appears to float above. The solitary arm represents a massive horological challenge that required skill and dexterity to manufacture. The construction of this required the balance to be perfectly perpendicular to the movement – no small feat when things are measured in microns. With such a high level of advanced craftsmanship put into the watch, it is deservingly paired with a substantial 18k red gold case. The beautiful hue of red gold glows through the watch via a sapphire crystal case back that allows an uncompromised view of the hand-finished movement and EXO Tourbillon from the back. The manufacture movement caliber MB M16.68 is entirely hand with Côtes de Genève stripes, circular graining, and a mirror-polished pawl with the famed Minerva arrow. The manually wound movement powers the tourbillon and timing functions with elegance and precision. This exclusive watch is limited to 58 pieces worldwide, paying tribute to the year Montblanc Manufacture was founded in Villeret in 1858, and is certified by the Montblanc Laboratory Test 500. 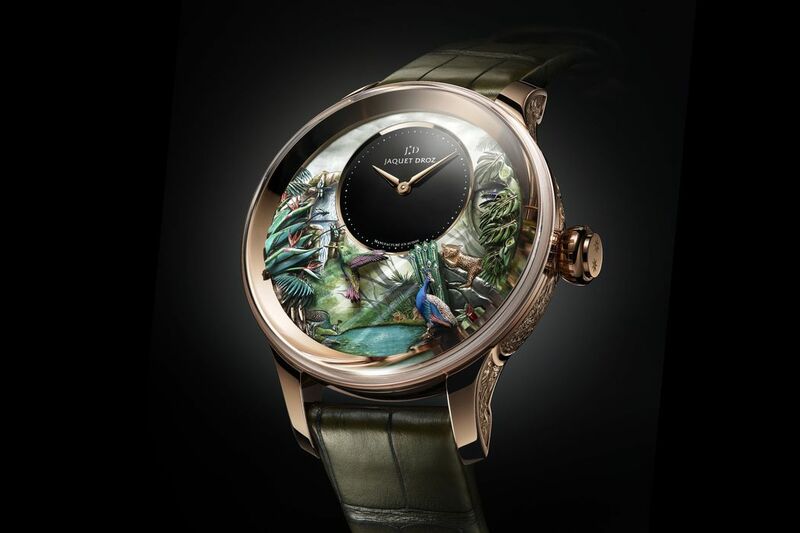 For a truly exotic wristwatch fitting to be encased in gold, look no further than the Jaquet Droz Tropical Bird Repeater, a sublime example of the perfect rendezvous of imagination, artistic sophistication and high-end watchmaking. The piece depicts an ultra-realistic rainforest on dial, complete with a waterfall among blooming tropical flora and fauna. 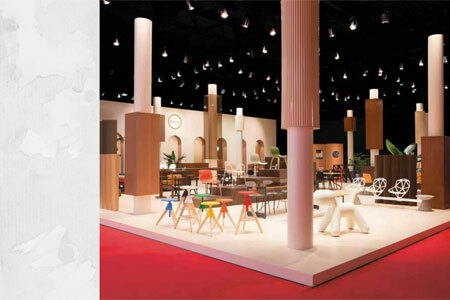 A celebration of ‘automata’ – moving mechanical devices that imitate life, a flurry of activity springs into action once the minute repeater is activated. Among them, the humming bird in the center of the dial beats its wings up to 40 times per second, the peacock opens its tail, and dragonflies dance. All in there are seven independent animations that allow for up to 120 different scenarios, an astonishing feat considering this is purely mechanical. Beyond the exquisite animations, at the heart is one of the grandest horological complications, the minute repeater. The new Jaquet Droz RMA89 movement powers the timekeeping, as well as the repeater functions, activated by a push-piece. Hand-engraved decorations adorn the 47mm 18k red gold case that houses this masterpiece. 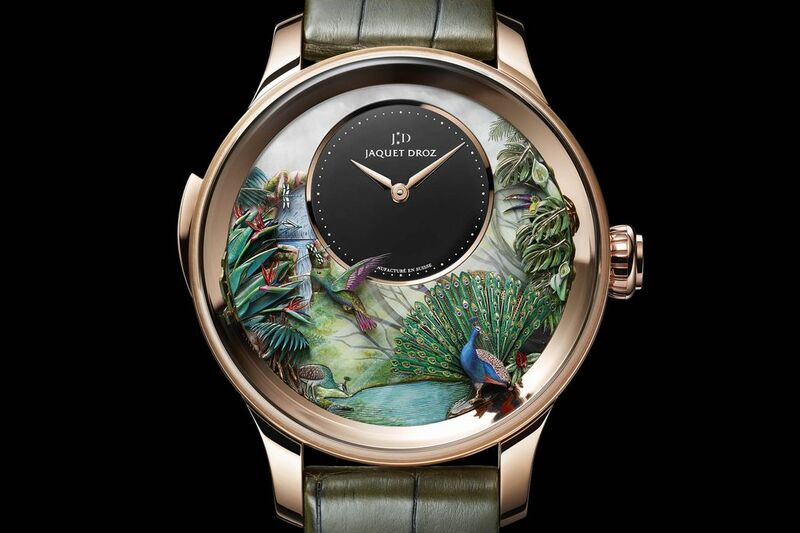 Only for the most astute of collectors, the Jaquet Droz Tropical Bird Repeater is limited to only eight numbered pieces worldwide.